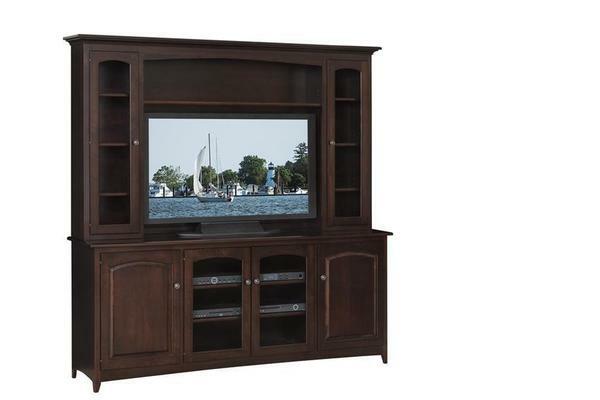 Ideal as a living room entertainment center, the Manchester Hutch-Top brings modern convenience and traditional solid wood quality to the American home. The Manchester's huge array of storage options and beautiful glass doors ensure that it looks just as good as it should, while its richly hand-finished surfaces give it the kind of glossy look and feel that you just can't find in a mass-produced pieces. The subtle curves along the tops of its panels and its solid, timeless tops add finishing flourishes to this stunning piece, ensuring that it will remain beautiful and current through decades of use, enjoyment, and evolving decor. Your Manchester will be build to order in your choice of wood with your choice of stain or paint. Simply select your ideal choices from the menus above, and if you run into any questions at all - big, small, or somewhere in between - please don't hesitate to reach out to one of our team by phone or by email at any time. We love how the Manchester combines stately design with family convenience, and we would love to talk with you about the sense of traditional beauty and comfort that it brings to the home.